CPQ (Configure-Price-Quote) offers five easy ways to address the challenges of seasonal selling by flattening out those peaks and valleys associated with natural, seasonal demand cycles. Google the term, Seasonal Selling, and you will be rewarded with thousands of links to content related to retail survival beyond the holiday season. But, seasonal selling also presents considerable challenges to B2B manufacturers and selling organizations. Seasonal sales cycles affect almost any product or service to some degree. There are many strategies to address seasonal cycles that involve how you manage products and influence how you develop new products. Some of these strategies get down into the deep recesses of your product management and engineering organizations. Other strategies offer measurable improvements in sales efficiency without bringing in industry gurus, reorganizing your product management group or resorting to any other large-scale reform projects. CPQ solutions deliver functionality that will support five specific strategies to overcome the “long, cold winter” of selling products out of season. CPQ allows you to boost sales by taking advantage of natural customer expectations along with market dynamics to creatively apply different combinations of products, options and pricing to stimulate sales during the off season. In most industries, the implication of seasonal business activity goes beyond the calendar. Consider HVAC as an example. HVAC manufacturers can segment their market into four major divisions: commercial versus residential and new construction versus replacement products for existing buildings. These four markets are distinctly different. Commercial HVAC manufacturing involves a near-contract manufacturing level of customization while the residential market is closer to a complex, discrete model with higher levels of repetition. The new construction versus replacement manufacturing dynamic also differs in terms of one being driven by economic development in general and the other by part failure, regulatory change and sales level of existing structures. These dynamics can be used to help the HVAC and other industrial manufacturers spread business activity and production scheduling more evenly over the entire year. Let’s take a look at five specific strategies and how they might be used to mitigate the extremes of feast or famine during the production year. Snow shovels, Christmas trees, convertibles, sandals and space heaters are all examples of products that don’t demonstrate strong demand over all 365 days of the year. Additionally, these products tend to demand higher, less-flexible pricing during their tradition high-demand season. Consider the specialty vehicle manufacturer that offers attachments for municipal street maintenance. Snow plows and salt spreaders are in demand from October through March. Discounting these products during the summer months will help move unsold inventory and may even justify keeping an assembly line open. During the spring and summer, your main products may be street cleaning, pothole filling and line-painting attachments that are aggressively priced during peak months and discounted during off months. 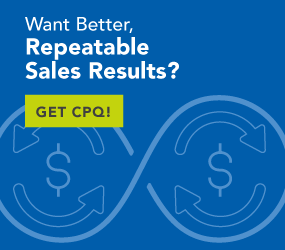 CPQ gives you the power to adjust your price, on the fly and in real time, to increase the appeal of spending money on an off-season product with a lower price. CPQ can help you execute the strategy by supporting off-season promotions and incentives that will drive interest and participation by your sales force. I have a lawnmower powered by rechargeable batteries. The manufacturer has done a great job of delivering heavy-duty power tools powered by a universally sized, rechargeable battery pack. You buy a single battery and recharge station that supports a wide variety of tools such as lawnmowers, chainsaws, weed trimmers, hedge trimmers, blowers and more. This product line lends itself to product-bundling strategies. I can buy a hedge trimmer in the spring and also pick up a snow blower attachment for about half of what I might pay in November. Each add-on sale is a kind of upselling or cross-selling type of transaction. This also works in the HVAC world. Most residential HVAC systems are sold with both furnace and air-conditioning modules. Bundling the two together makes sense for a lot of reasons. No one wants to buy an air conditioner in January or a furnace in July. Bundling them as a single unit reduces the cost of selling by covering two products in a single selling cycle. CPQ facilitates this strategy with all manner of products. When the rep and customer are configuring products, the options offered up by CPQ can contain specific product bundles as an option. Many products are designed for some kind of generalized usage, but they are marketed toward a single defined usage. Using my modular, battery-powered, lawn-maintenance product as an example, consider the blower attachment. The blower can be used to move grass clippings in the summer, leaves in the fall and snow in the winter. CPQ can help you take this a step further by identifying the product as a leaf blower, a snow blower or clean-up blower within the CPQ configuration selection menus. The actual product configuration may or may not vary, but the interchangeable description assures that the option is not overlooked by linking and limiting it to a single, final product. The automotive industry has made great use of this strategy within the design of its products. Simple things like interior door-latch handles, gear-shift selectors or entire engines are used across multiple products. CPQ may or may not classify the product with different descriptions during specific times of the year or list the product as three separate options year-round. Regardless, the product is presented with utility aligned to tasks of the specific seasonal product involved. Sales reps can offer more than just the individual products for sale. Some products are just not going to have as much relevance out of season as others. But, that does not mean there are not opportunities to increase revenue through add-on product sales or service-oriented offerings such as tune-ups or PM packages, features option upgrades or even trade-in promos. It has become more common of late to decouple warranty and performance guarantees from the actual product price. Almost any complex product can now be offered with add-on service packages, preventive maintenance and other after-sale support options such as new-hire training or a user-story sharing facility. CPQ can present these at the time of the initial product sale or as standalone products to offer during follow-up calls or recurring customer support calls. In my drinking days, we would always proclaim, it’s five o’clock somewhere. This adage holds true for most products with seasonal utility. Heating Ventilation Air Conditioning (HVAC) manufacturers have always understood that summer time in the northern hemisphere means it is winter time in the south. They sell space heaters at one end of the planet and air-conditioner units at the other. CPQ can help address these moving markets by applying seasonal pricing in alignment with the season for each geographical market segment. Low prices for the off season rolling over to high prices for the peak season all driven by whatever locale the offering is made in. CPQ has no problem maintaining multiple price lists based on multiple geographies, markets or promotional variabilities in place at a given time. CPQ offers the manufacturer the ability to address all markets, regardless of location or time of year with equal dexterity. Products offered, prices offered and geographies served are all elements in the process of successfully addressing the seasonal cycles associated with selling products around the world.